Challenges on the 40th anniversary of the Spanish constitution: Can Spain find a way to accommodate Catalonia? This year marks the 40th anniversary of the Spanish constitution, which came into effect on 29 December 1978. But as Javier Garcia Oliva explains, the status of Catalonia within Spain represents a major challenge for the current constitutional order. He writes that while Pedro Sanchez has an unenviable task in disentangling all of the issues surrounding Catalonia, the events of 1978 might serve as inspiration for Spanish society as it seeks to find a way through the Catalan crisis. The Spanish political scene has moved on drastically since my previous blog discussing the turmoil in Catalonia, and with the shifting context, new legal issues are presented. Critically, of course, there has been a change in Prime Minister, and the new left-wing incumbent, Pedro Sanchez, has been keen to distance himself from the inflexibility displayed by his conservative predecessor, Mariano Rajoy. Whilst Rajoy had kept the door firmly closed on any discussion, Sanchez has from the outset emphasised his willingness to open up dialogue. His most tangible proposal to date has been to offer a referendum on greater autonomy for Catalonia. This move has not been warmly received by separatist politicians for two principal reasons. Firstly, Sanchez has emphasised that the proposal will be on increased self-government, rather than self-determination: in other words, no independence referendum is on the cards. Secondly, there are fears in the separatist camp that the compromise might actually appeal to many people in the region, seducing them away from support for independence, much as Cameron’s offer of ‘devo-max’ proved decisive in the popular Scottish vote. To complicate matters even further at a political level, neither Pedro Sanchez nor Joaquim Torra (the separatist regional President in Catalonia) are as secure in their position as they would like to be. 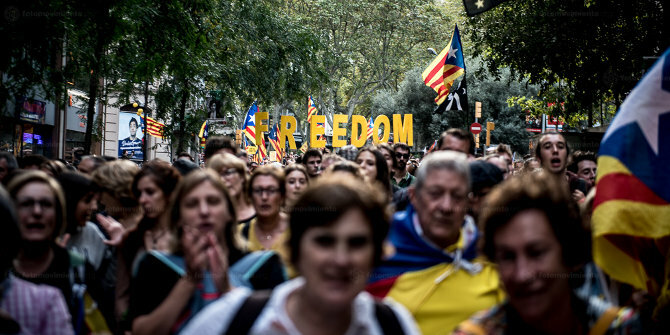 In Barcelona, the pro-independence parties are divided on the optimal way forward, and as a result have lost effective control of the Catalan assembly. Meanwhile, in Madrid, Sanchez only came to power when Rajoy was toppled by a vote of no confidence, precipitated by an ongoing corruption scandal, and risks losing his hold on power if Torra carries out his threat to withdraw the support of the pro-independence parties from the Sanchez government. In reply, Sanchez has indicated that he will not be blackmailed, and is prepared to call a general election if circumstances demand it. Detailed speculation about the immediate future belongs more to the realm of political pundits than legal commentators. Torra’s attempt to bring pressure to bear on Sanchez to agree to a pro-independence vote by threatening to destabilise the national administration may or may not be a bluff in a high-stakes poker game. So, how does all of this political wrangling relate to the legal and constitutional backdrop? Firstly, there is the question of what exactly Sanchez is proposing for Catalonia, and how it would affect the constitutional arrangements of the Spanish nation as a whole. When the modern 1978 Constitution was negotiated and adopted, its architects chose to pursue a hybrid model, which was neither federal nor centralist. In practical terms, it is impossible to tinker with part of the machinery without affecting the whole engine. Would the new Catalonia still be a comunidad autónoma (autonomous community), the current highest level of regional governmental unit (see Constitution Art 137)? Regardless of how that question is answered, challenges will arise. On the one hand, if Catalonia continues as an autonomous community, why should it be granted greater privileges or status than the others? Equally, if it is given a distinct and special form of being, what is it about Catalonia which justifies this, in contrast to say, Andalucia, the Basque Country or Galicia? Furthermore, is this new kind of legal entity a prelude or step along the journey towards independence for Catalonia or full-blown federalism for Spain? In addition, whatever form the new Catalan arrangement may take, it must either be compatible with the wider Constitution, or there must be more drastic constitutional reform. The latter would mean that the impact of reform upon the rights of all Spaniards would be brought into sharper focus. For instance, the present Art 138 (2) provides: “Differences between Statutes [statues in this context should be read as regional mini-constitutions] of the different Self-governing Communities may in no case imply economic or social privileges”, and Art 139 states as follows: “All Spaniards have the same rights and obligations in any part of the State territory.” One of the key things which Sanchez has hinted at offering, and which is likely to be a necessary carrot to obtain agreement to this proposal, is greater autonomy in relation to tax. This is, of course, not surprising, as many disputes around independence and governance coalesce around an explosive mix of ideology and lucre. Nevertheless, squaring concessions to Catalonia in fiscal matters with the content of Articles 138 and 139 may not be straightforward. The other elephant in the room is the fate of the Catalan politicians who used public funds to organise an independent referendum which Spanish courts had clearly and firmly declared unconstitutional. All of these figures at present remain either in prison or exile. This issue is undoubtedly divisive, with their supporters seeing them as prisoners of conscience or political refugees. However, in terms of legality, the uncomfortable fact remains that they wilfully appropriated tax-payers’ money to further their own party political ends, despite the fact that they had been told by a judge that they could not do so. If politicians are permitted to substitute their own sense of morality with what has been declared lawful by the courts, and are only bound by the rule of law when they subjectively consider it fair (or, more cynically, expedient), what meaningful buttress is left against tyranny? The position is further complicated by the fact that in another context Sanchez has indicated the possibility of constitutional reform to make it harder for corrupt politicians, judges and officials to claim immunity from legal investigation and sanction. There would be something of a mixed message about coming down hard on financial abuses in one context, whilst being seen to condone it in another setting, at least in some eyes. At the end of the day, it is difficult to justify the contention that the motivation of a politician or official in siphoning off societal funds for illegal purposes should be relevant to the criminal status of the act. Does it truly matter whether the stolen money has been channelled into a villa in the countryside or an un-constitutional referendum, when it has been deliberately appropriated from the public purse? It is impossible to deny that Pedro Sanchez and his legal advisors have an unenviable task in disentangling all of these issues. Nevertheless, as Spain marks the 40th anniversary of the Spanish Constitution, it is worth pausing to reflect on the past achievements of this nation in reaching a compromise between opposing perspectives and apparently mutually incompatible positions. If Spain could emerge from the Franco era without further bloodshed, and construct a constitutional settlement which would guarantee peace, security and human rights, then there seems every reason to believe that Spanish society can find a way through the Catalan crisis. Javier Garcia Oliva is a Senior Lecturer in Law at the University of Manchester.